11 November 2008 — In the midst of these uncertain days, at the risk of ruffling some feathers, we must take this occasion to gloat over something afforded to us, at long last, by our unique position. First, the specific feathers that might likely be ruffled by this “gloatation” belong to those who patiently await the ability to use Helix reliably in macOS, whether as a single user or a workgroup. Which would pretty much be all of you out there. Second, the uniqueness of our position. We are the first people who get to use Helix each time the engineers say “OK, try this,” in response to the latest improvements. Getting to “OK, try this” generally involves anywhere from a few hours to several weeks. Rarely (but not impossibly) longer. By now, most people should realize that we have built a fairly reliable “torture track” for Helix. If there’s something really wrong at this point — after more than 80 “OK, try this” moments since we began work on Helix Engine and Client for macOS — it doesn’t take us long to find it. Fixing it, however, is always another story. Three times in this cycle, the “OK, try this” moment has resulted in short, successful beta tests followed by new Preview Releases of the macOS Engine and Client. Each Preview Release was a milestone that brought with it more functionality. For those already using Helix successfully, each Preview provided more options; for those not yet using it, another reason to give it a serious look. In each of these moments, there was always a Classic “fall-back position” to handle the functions that were not yet available in the Preview Release. The list of those unavailable functions grows shorter every day. In a macro sense, only Power Query remains on that list. At this very moment, another “OK, try this” moment is in the process of (hopefully) becoming a "Let’s let everyone try this" event. In fact, one piece of it is already available for those who wish to join Fridays' HelixChats. They’ve been hit-or-miss of late, but don’t be surprised to see them resuscitated and enlivened again soon. Into this environment we introduce the “Classic-free day.” In our aforementioned unique position, a few weeks ago, we first tested a build of Helix that did some marvelous things. It also contained a handful of really nasty “land mines.” Once we were able to consciously steer clear of those, we found ourselves spending all day in Helix Client, connected via the internet to a Helix Server 250 miles away. It was a joyous moment at the end of the first full day when we realized that we hadn’t had to venture into Classic for anything the whole day. The more we work with this particular version, and the subsequent builds that have resulted from fixing the various pre-beta glitches we’ve uncovered in the process, the more we enjoy working with it, doing things we may not have done in years, just to see them work. Like many of you, we tend to work with a lot of different applications at once. Not all Helix Client users have experienced this, but the current Classic Helix Client has had, for a few versions now, an occasional tendency to go out to lunch when left in the background. No harm is ever done, other than having to occasionally force quit. Yet for us, that formed part of a performance baseline that was inadequate. The bar was set higher. This new macOS Client cleared it beautifully just by staying connected whenever it was on, regardless of what else might be happening on the machine. The second day, it went down for a moment. But in retrospect, that may have coincided with an HMM run (if you don’t know what an HMM run is, you should learn about Helix Maintenance Manager). Since that day, we have had three sensational updates of the new code. Not even our beta testers have seen this stuff yet because there are still some minor problems we need to fix first. We can never emphasize strongly enough the need for good quality beta testing. To get a quality beta test, you must first respect the fact that your testers are volunteers. One way we try to do this is by giving them something as reliable as we can make it. If we don’t, we waste their time and make it more difficult to get them interested in investing their time in the next round. The nature of our paritcular beast is that it tends to suffer a lot of growing pains, and each and every one needs to be identified and corrected. The more of that we can do ourselves, the better each round of beta testing goes. But there’s no substitute for real-life use, of course, because in real life, people aren’t going to do everything "the way they’re supposed to." On that score, Helix 6.1 is being used in an almost surreal set of configurations. For instance, some people are running Helix Server 6.1 for Intel on an Intel Mac of some sort, but all their clients are visiting it with Classic on a G4 or G5 and some old colorful iMacs running OS 9. Some have Helix Server 6.1 for PowerPC running on a G4 Tower with only PowerPC Mac laptops connecting to it remotely, some using Classic, some macOS Clients. Some are running all Intel. Others are running with the full range of three different types of client (Classic, PowerPC and Intel) and some are even running the PowerPC products on Intel Machines under Rosetta. It’s a free country. And in that free country, there’s so much to see and do in a Classic-free day. Buttons are all nicely rendered now, no ugly stuff at the corners. Previously problematic entry windows seem to fly open full of information. List performance has improved, and we haven’t really begun to look at performance yet. The continually evolving Helix Client for macOS now sports an enhanced structure file that no longer asks you to decide if you want to save after each work session, saving you time and giving you more security. And--oh yes--did we mention that it prints? Or that it does document management? Or that it does both of those things pretty well? If not yet 100%, still quite usable. And it only continues to improve. And it has now given us more than a dozen Classic-free days. Soon you’ll be able to share the experience of being weaned off Classic Helix. And when that day arrives, because of our unique positions, we’ll be starting to take the occasional glance over the hill at the last valley, where, we know, many Helix users are still waiting. Power Query, performance and RADE. While there may still be lots of things to fix and improve, those are the main jobs that remain. First, Power Query will be restored, and improved. Some energy will then likely be devoted to performance. And then work will resume on RADE in earnest. If you are out there using Helix RADE and Helix Server and you still haven’t upgraded to Helix 6, please stop reading and upgrade right away. Our macOS native Helix Server has been in production use now for three years. It is rock solid. Buying your upgrade will expand your options and help assure our future together. If you’re already using Helix Server 6.0 or Helix Server 6.1 for PowerPC, please take a moment to consider the following suggestion. In July of this year, when we started selling Helix Server 6.1 for Intel, we simplified our price structure, essentially eliminating the separate charge for the Server. We calculated that if we could upgrade just two or three users of Helix Server for PowerPC each week, we’d have a stream of income that would last us well over a year. Of course the best-laid plans of mice and men often go awry. In our case, an early stampede lead rapily to a trickle. We were smart enough to build a little war chest, so we aren’t slowing down at all, but we can see far enough ahead to know that if not enough people upgrade to Server 6.1 for Intel, we’ll be running on fumes again next year. Of course, many of you don’t need Helix Server for Intel yet — you’re still running your Helix Server on a G4 or G5, and the PowerPC version is working fine. But if the past two years have taught us anything, it’s that PowerPC Macs are starting to reach their “MTBFs”* and you can’t replace them. One day you’re going to need to upgrade your Server hardware and that on that day, Intel will be the only game in town. So with that knowledge, please consider buying the Server for Intel upgrade between now and the end of 2008. You can write it off on this years' expenses and use 2009 for your hardware upgrade purchases. …a stocking stuffer for the computer-age historian in your family. 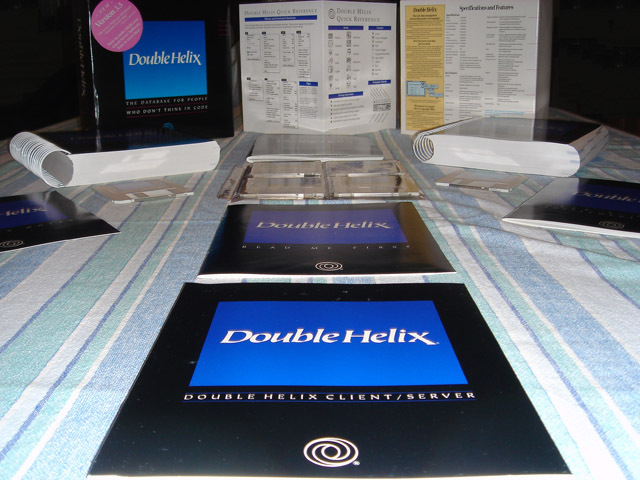 We recently found a cool cache of shrink-wrapped boxes of Double Helix 3.5. If you’re upgrading to Intel Server and RADE 6.1, we’ll throw one of those boxes in for free, along with a nifty CD-ROM containing the very latest and greatest version of Helix, which, of course, you will not find in the shrink-wrapped box. If you’ve already upgraded, or you just want the box, give Gil a call at 1.800.784.7018 and he’ll see what he can do for you. There are only eight of these boxes, and one had to be ripped open to display its contents, so don’t delay. They will be awarded on a first-come, first served basis  whether through the web store or on the phone. Finally, while we always need funds to keep working, right now what we probably need as much as funding is for you to know that this work has not stopped. We need you to maintain your collective hope during this difficult phase. There’s never a logical explanation for it, but without hope, there is nothing. With hope, we will find a way to keep all the parts of Helix moving toward their appropriate next destinations.